For book lovers, there’s no better time than summer. Lazy weekend afternoons on the beach, in the park or by the pool is made even better with a great book to escape into. 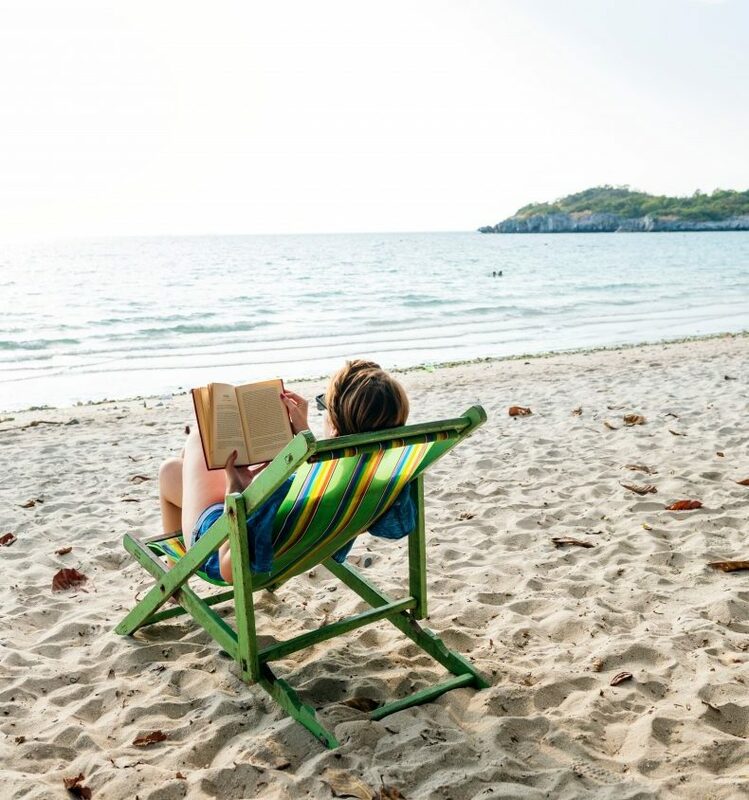 And while there are hundreds of perfect “beach reads,” there are also just as many books that can improve our minds and souls as we improve our tan. Volunteering requires many skills, but empathy and respect for our clients tops the list. When we better understand the complex factors that brought our clients to a place of need, and we suspend judgment in favor of compassion, everyone is better off. The following seven books share stories of people who have faced difficulties in their lives and allow us to walk vicariously in their shoes for a mile. While we cannot fully appreciate their struggles or fix them, we can become more empathetic humans. Make this your summer of love! Modern medicine has allowed humans to live longer than any generation in history. Yet in the quest for sustaining life, we often forsake quality of life. Dr. Gawande’s examination of how we treat end-of-life care and the people we’re purporting to help forces us to reconsider our assumptions of what makes a life worth living. Consider that success in medicine may not always be measured in length of life but in quality of life. Value a person’s autonomy in deciding how they want the last of their life to be lived, even if that decision is painful for the survivors. Humans, as cruel as we’ve shown ourselves to be throughout history, also have a limitless reserve of compassion for other forms of life, from the cutest abandoned puppy to the ugliest spider we gently scoop up and toss outside. Yet, Jahren’s memoir brings out an even deeper level of empathy for all forms of life, in this case those in the plant world. After reading her meditative and reverent prose on all things botanical, you’ll no longer be able to cut down trees or plants without a twinge of guilt. More importantly, Jahren reminds us how vitally important it is for us to be good stewards of plants and trees and respect their existence for the miracles they truly are. Gain a better appreciation of the role of scientists in the world and why we should mentor and encourage children toward the sciences. Realize how little we really understand about our natural world and how many mysteries still wait to be uncovered. Appreciate the stigma and discrimination many women in the sciences and academia still deal with in their fields. “Home is where the heart is” or so goes the saying, but what if your home is under constant threat being taken from you because you can’t afford the rent? That’s the dilemma faced by millions of Americans every day. American sociologist, urban ethnographer and MacArthur “Genius” grant recipient Matthew Desmond follows eight poor families in Milwaukee during the recession as they struggle to provide housing for themselves and their families. Gain insight into the tenant/landlord relationship, the eviction process and the struggles poor people face in securing and keeping quality housing. Understand the lack of power poor people have within the legal system. Recognize the emotional and physical toll a lack of housing causes on people, their ability to work and do well in school. The 2016 presidential election strained American social norms of civility and tolerance. Both sides of the political spectrum unleashed a fury of disgust, vitriol and accusations against each other, but Goldstein’s well- researched book provides an insight into a few of the economic factors that contributed to this deep divide. While Janesville is about the economic and social unraveling of one Midwestern town after a GM plant closure, these stories are representative of hundreds of towns across America that have been forced to reinvent themselves as well-paying manufacturing jobs are no longer a stable ladder to middle class life. Understand how the closing of one American factory can have long-lasting ripple effects within in the community. Recognize how quickly economic stability can be undermined, and appreciate how losing a job affects not just the parents but also the children. Understand the economic and emotional difficulties of mid-career reinvention. Develop greater patience for nontraditional students who haven’t been to school in decades. “Build the wall. Build the wall.” It’s a refrain that has echoed throughout political rallies for the last two years. But Conover’s immersive reporting provides readers with an up-close view of the illegal immigrant’s journey from Mexico into the United States. No matter your political stance, his year experience—from working and living with migrant agricultural workers in Arizona and Florida to crossing the Arizona desert—highlight the desperation, poverty and literal hunger that drives 1000s of Mexicans to America every year. Even though this is one of the older books on the list, its message and stories still resonate even in 2018. Understand the economic reasons that drive Mexicans to the US and the current laws that make legal immigration from Mexico so difficult. Hear the personal stories of illegal immigrants and what motivates them to risk their lives and leave their homeland. Recognize that 99.9 % of illegal immigrants aren’t rapists and murderers but mothers, fathers, children and teenagers who dream of a better life for themselves and their families. According to the U.S. Department of Health and Human Services, 42, 249 people died from an overdose of opioids in 2016 alone. Acclaimed journalist Quinones deftly examines the intertwining factors of black tar heroin, aggressive marketing and over prescription of painkillers that contributed to one of the country’s worst drug epidemics since crack cocaine in the 1980s and early 90s. Appreciate that drug addiction transcends age, gender, class and socioeconomic status. It can happen to anyone. Develop a greater understanding of the emotional and financial burden drug addiction places on families of addicts. Understand the iron grip heroin and other opiates have on addicts and why recovery is such a difficult, almost Sisyphean task. Become educated on the economic and regulatory factors that contribute to such an epidemic. For many readers, Roz Chast’s memoir may be their first experience with a graphic novel. And while caring for aging parents might, at first, seem an odd topic for this genre, readers will quickly find the colorful and darkly comedic drawing disturbingly apropos. At turns brutally honest and deeply poignant, Chast gives readers permission to express our deep fears and frustration at the absurd and bewildering role reversal children face as their parents age. Understand there are many reasons (financial, personal, physical) a child may chose to have a parent in a nursing home. It’s not our place to judge that decision. Recognize the emotional stress of managing an aging or deceased parents’ home and their belongings. Appreciate the important role elderly caregivers have not only for the clients but also for the children of those clients who are emotionally, financially and physically tired and often overwhelmed. Learn more about VolunteerMark’s commitment to improving the volunteer management process here or email us for more information.